I was talking with a friend on the phone today, and he brought up a good point that I was feeling…but couldn’t describe: The Denver Broncos played on Thursday, so what am I going to do on Sunday?? Since my childhood team was the Dallas Cowboys, I guess I’ll watch them battle the Cincinnati Bengals on Sunday. I do think they are a much better (and balanced) team with a healthy DeMarco Murray. FYI, you can read one of my many comparisons between the Denver Broncos and Dallas Cowboys in my recent post: Sloppy vs Disciplined – Leadership Lessons from the Dallas Cowboys and Denver Broncos. Good to see Matt Prater MAKING field goals again, but I’m a little concerned that we are recently scoring more field goals than touchdowns in the red zone. Knowshon Moreno can be more than just a “fill-in” as a running back. People need to get over the McDaniels years, and the fact that he is a “first round bust” that came back slowly from an injury. Look at his potential now in a Manning-led offense, and look at his attitude after a dose of humble pie this year! Meanwhile, Ronnie Hillman could be the next Darren Sproles as he continues to mature. Those young Broncos receivers catch with their hands – very well, I might add! Demaryius Thomas and Eric Decker will make Manning forget about Marvin Harrison and Reggie Wayne, and Jacob Tamme / Joel Dreessen are great tight ends. Brandon Stokley is timeless – he is a safety valve for Manning, and he can really teach these receivers the art of being intelligent and consistent professionals. 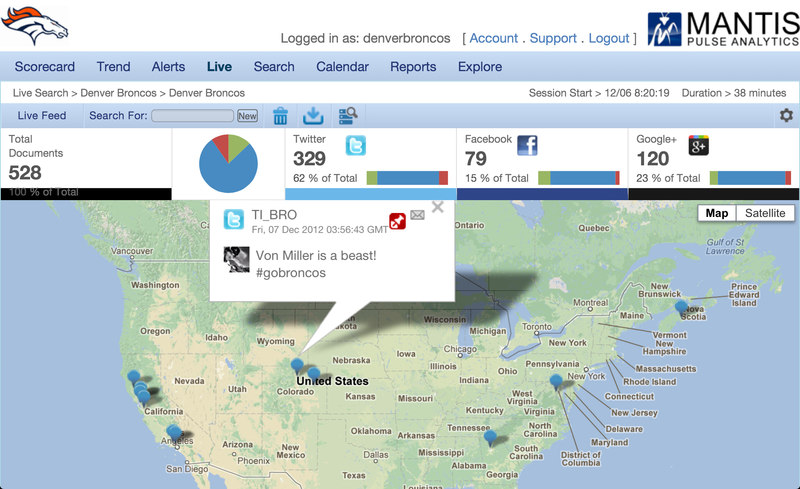 Von Miller is relentless and should be defensive player of the year. His maturity in pass coverage is also impressive. Elvis Dumervil is still a handful. We missed Chris Kuper in the offensive line blocking schemes – too many sacks on Manning. It also affected our red zone efficiency because the Raiders were blowing up that right side of the Denver Broncos offensive line and getting too much penetration. I think we missed Wesley Woodyard, too. He is a great story who used determination and leadership qualities to go from a special teams player to a starting linebacker. Derek Wolfe and Mitch Unrein are keepers on that defensive line – and it’s good to have an infusion of youth at that position. Same goes for Tony Carter and Chris Harris in the secondary – and it was great to see Champ Bailey get another interception. Trindon Holliday is an electric kick and punt returner; however, he must learn “discretion is the better part of valor” and call for the fair catch versus risk putting the ball on the ground when the coverage team is right on top of him! I was watching the game with my iPad in my lap. I’m usually on both Facebook and Twitter during the game, but I also had a Pulse Analytics session going while watching the game. 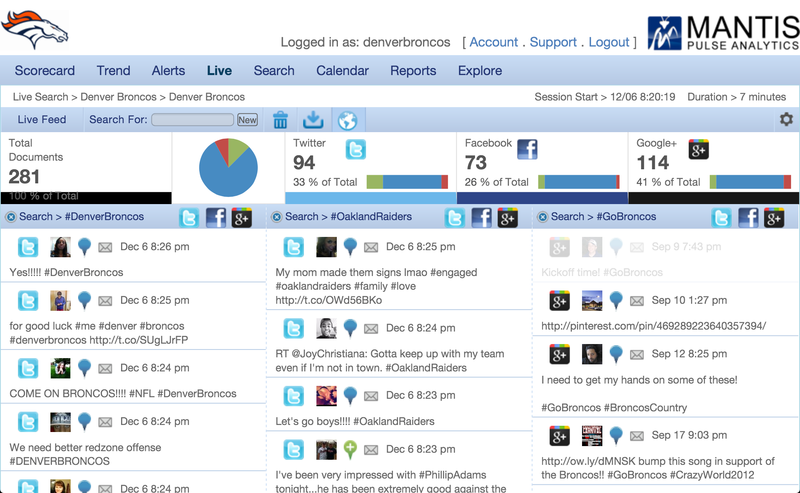 Here are a couple of screenshots to see fan sentiment as well as illustrate how good Pulse Analytics looks on a tablet! Of course, some folks love the Map View. If I let this Map View go for an entire game – or an entire episode of something like NBC The Voice – you see how these “global brands” have passionate fans that span the globe. Here is my invite for other Denver Broncos fans to comment on what they thought of this recent Denver Broncos game. And if you are not a Broncos fan, I’m sorry! Actually, let me know your sentiment on your team’s chances in the playoffs – or if you have a coach on the hot seat or quarterback controversy brewing this year! Maybe I’ll write a Sentiment Analysis post on your NFL team next! Note: These Pulse Analytics collections are for demonstration purposes only and do not imply client relationships between Mantis and the teams mentioned. The collections are tracking a subset of keywords and topics for the NFL teams, and they are intended to illustrate just some of the cool features in Pulse Analytics. Schedule a demonstration if you would like to see what consumers are saying about YOUR brand, and come engage with us on the Pulse Analytics Facebook Fan Page.